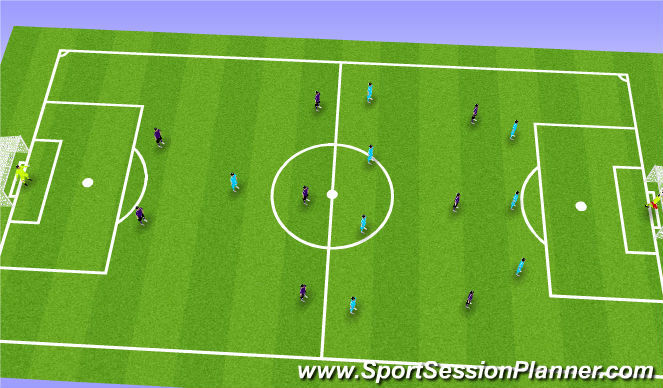 This is a UEFA A Licence Component 1 drill looking at Defending as a team in a 3-5-2 formation. 3 attacking midfielders will join the play as the return ball is played. Half of a Full Pitch is used. Drill - Play begins with the Blue Midfielders playing a pass into the strikers feet. As this ball is played the 2 recovering Red midfielders join the play. The ball is then bounced back to one of the 3 Blue Midfielders and the play begins. The Blues will attack the Main goal. If the Red Defending team win the ball back they will look to play the ball out through the gates recently occupied by the recovering midfielders. 2/3 of a Full Pitch. Drill - Play begins with the Blue team attacking the main goal. If the reds win the ball they must play the ball out past the line marked out on the pitch and try to score (defence unit must squeeze up). 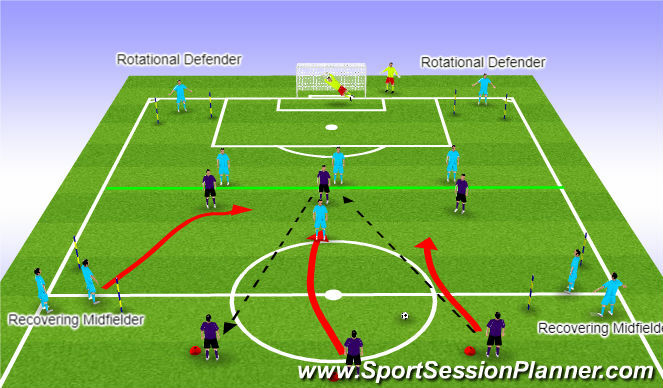 This will encourage the defenders to play the ball out from the back and be positive in the transition from defence -> attack. 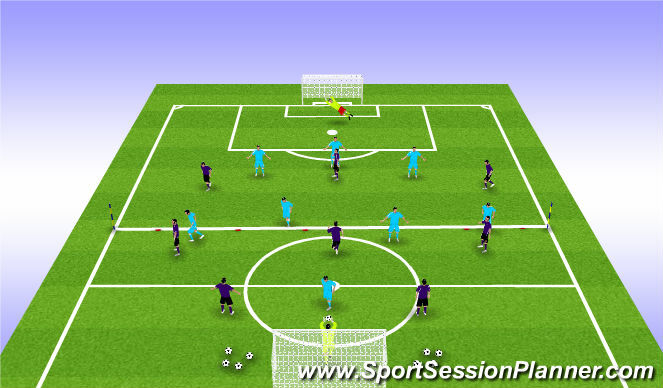 Coaching Points - Keep a good defensive line to play Strikers offside. Constant communication from all defenders plus the goalkeeper. CMs remain strict in their position, invite the ball to go wide. Striker is in possession the nearest CB should engage the player. As this happens the other CB should deepen and both WBs deepen and narrow. This is a UEFA A Phase of Play which will look at Defending as a team in a 3-5-2. It will look at the movements and decisions made by the defending team. When Ronaldo picks up the ball the LCB should try and show him away from goal. No Juventus player matches the run of Carvajal. Juventus Middle centre back should recover to the middle of the 18 yard box as the CB has originally pressed the ball and cannot make the distance to cover the space. No one tracks the movement of Ronaldo after he plays into Carvajal. -Appropriate player is pressing the ball in the correct position with the correct body shape. -If caught out of possession can our defenders track runners and offer support to the back 3.